Is your computer consistently crashing? Is it difficult to load pages or files? If you need to replace a failing or broken hard drive, All Things Surplus is a dependable provider of computer hardware. Additionally, we carry products that are considered obsolete or hard to find due to diminishing manufacturing sources and material shortages within the industry. Our inclusive inventory is readily available to clients looking to buy notebook hard drives, Solid State Drives SSD, enterprise hard drives, and much more. You can rely on All Things Surplus for Fibre Channel, CE-ATA, ZIF, IPI, IDE/ PATA/ ATA, SCSI, SAS and USB hard drives. We also have numerous SATA hard drives in stock and ready to be shipped if you're looking to buy Intel SSD SATA or Samsung SSD m-SATA models. 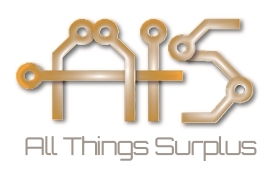 All Things Surplus consistently strives to offer quality hardware, fair rates, and unparalleled service. Whether you're in the market for a Hard Drive or SSD you can feel confident in our ability to fulfill your hard drive needs.